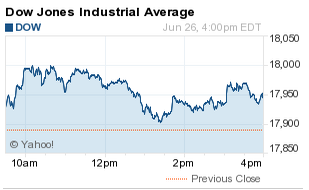 The DJIA today added 56 points as investors monitored the ongoing debt drama in Greece. The Nasdaq and S&P 500 slipped as semiconductor stocks cratered under the weight of weak forward guidance. Shoe and apparel maker Nike Inc. (NYSE: NKE) was the S&P 500's top performer today, adding 4.26%. Yesterday, the company beat Wall Street earnings expectations and said global sales increased 4.8% over the quarter. Meanwhile, the Nasdaq slipped more than 0.6% after Micron Technology Inc. (Nasdaq: MU) announced weak quarterly earnings and issued a weak 2015 outlook. The company's struggles pulled down shares of chipmakers like Intel Corp. (Nasdaq: INTC), Broadcom Corp. (Nasdaq: BRCM), and Advanced Micro Devices Inc. (Nasdaq: AMD). The S&P 500 Volatility Index (VIX), the market's fear gauge, was flat today. Greece Update: European leaders were looking to extend Greece's debt deadline by helping the nation pay its maturing debt. However, Greece rejected the deal, setting the stage of a last-minute meeting on Sunday to try to try to salvage it. The Greek debt talksare at a critical point. We put together a new Greece profit opportunity guide for you here. China Correction: Chinese stocks slumped more than 7% today, with the key CSI300 index falling nearly 8%, its largest single-day decline since 2008. The market has fallen more than 20% since hitting a seven-year high just two weeks ago. Traders are desperately trying to unwind positions taken with margin debt (borrowed money). Oil in Focus: WTI August oil futures dipped below $60 per barrel today as traders continue to monitor a possible deal between Iran and the West that would end oil sanctions on the crude producer. Brent oil was unchanged on the day. On Tap Next Week: On Monday, investors will react to the details of Sunday's meeting between European financial ministers and Greece over the latter's debt problems. A light U.S. economic calendar features the pending home sales index and farm prices. Companies that will report quarterly earnings include Apollo Education Group Inc. (Nasdaq: APOL), Castle Brands Inc. (NYSE: ROX), Global High Income Fund Inc. (NYSE: GHI), Park Electrochemical Corp. (NYSE: PKE), and Paychex Inc. (Nasdaq: PAYX). Stocks to Watch No. 1, ZTS:Shares of Zoetis Inc. (NYSE: ZTS) cratered 12.2% on news that Valeant Pharmaceuticals International Inc. (NYSE: VRX) has approached the animal health giant about a takeover bid. The news isn't surprising given Valeant's recent string of acquisitions and both companies' ties to activist investor Bill Ackman. Stocks to Watch No. 2, GPRO: Shares of GoPro Inc. (Nasdaq: GPRO) continue to falter as the camera manufacturer heads for its second-straight weekly loss. Consumer interest in action cameras appears to be cooling and wreaking havoc on the former IPO darling. GPRO stock is now down more than 14% this year. Stocks to Watch No. 3, THC/HCA/CYH/UNH: Healthcare stocks were still in focus after yesterday's U.S. Supreme Court decision to preserve federal subsidies under the Affordable Care Act. The news was a boon for hospital and insurance stocks. Shares of Tenet Healthcare Corp. (NYSE: THC), HCA Holdings Inc. (NYSE: HCA), Community Health Systems Inc. (NYSE: CYH), and UnitedHealth Group Inc. (NYSE: UNH) all received upgrades today.